Use a steel ball rolling past magnets to model gravity assist (also called gravitational slingshot and swing-by), which is used to alter the path and speed of spacecraft in the solar system. We have used rockets to send probes to many parts of the solar system, and beyond. For sending spacecraft these long distances, we need to keep the fuel usage to a minimum, as much of the weight of a rocket is fuel (90%). Once rockets have used much fuel to escape earth’s gravity, we can use the gravity of the sun or other planets to alter the path and speed of a spacecraft, with minimal further fuel usage. Using the gravity of other bodies to change the speed and direction of a spacecraft is called “gravity assist”, “gravitational slingshot”, or “swing-by”, and has been used to send probes to the outer reaches of, and beyond, the solar system. The amount by which the spacecraft speeds up or slows down is determined by whether it is passing behind or in front of the planet as the planet follows its orbit. 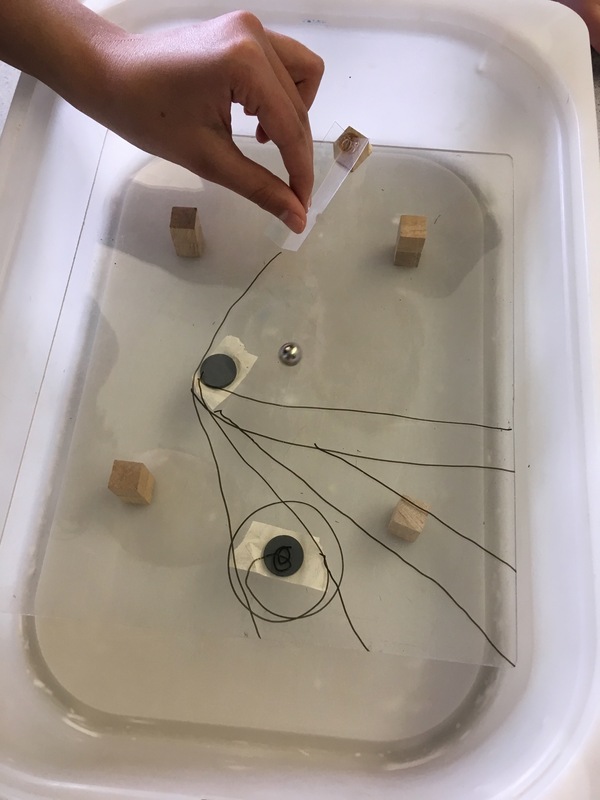 Students will model gravity assist by rolling a steel ball (the "spacecraft") down a ramp onto a plexi sheet, which has a magnet (the "gravity" of a planet) in its path. The spacecraft is deflected by the gravity of the planet as it passes by. The amount of deflection depends on the speed of the spacecraft, how close it passes by the planet and the gravitational strength of the planet. 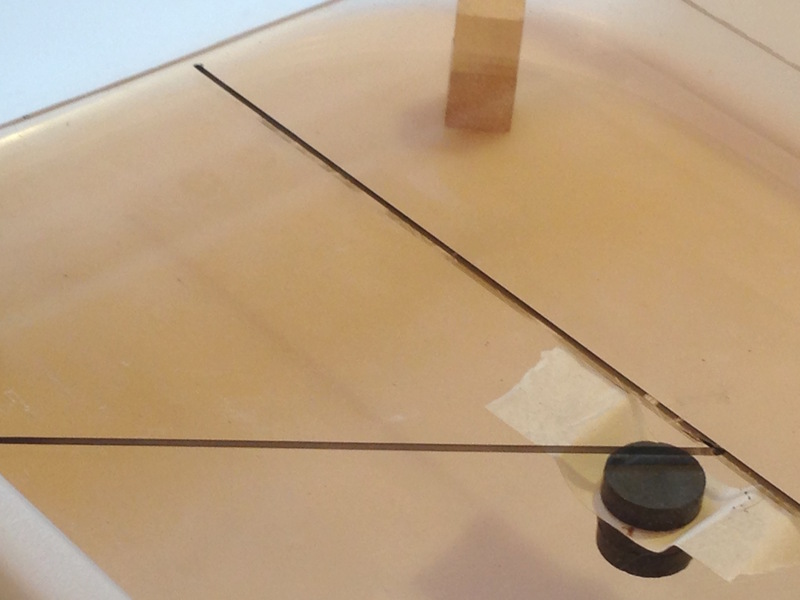 Draw a line down the centre of the plexi, along its length. 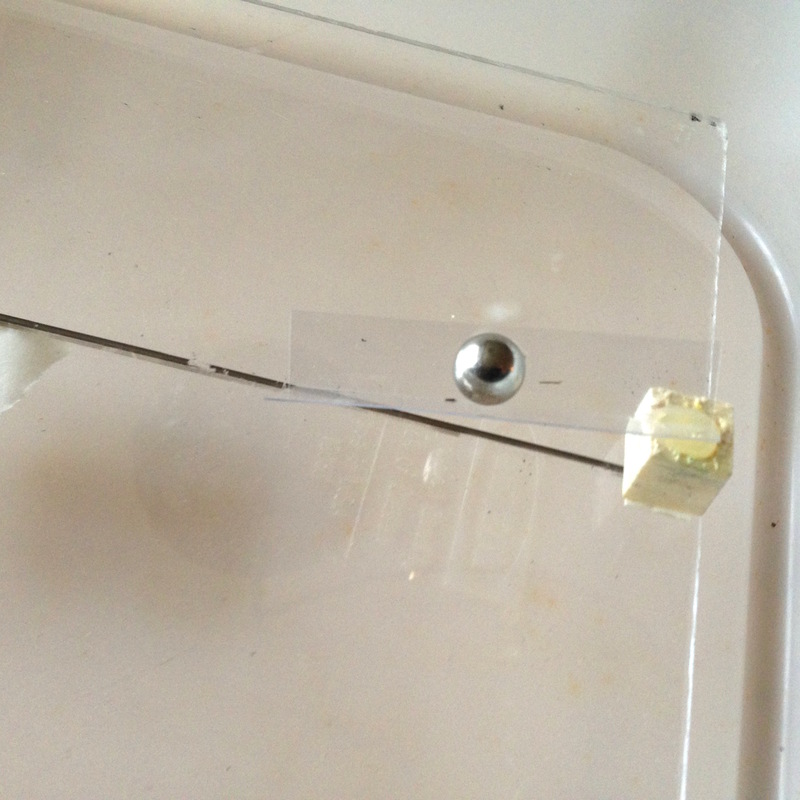 Tape the magnet onto the plexi, positioned just to the side of the central line and half way along it. Turn the plexi over so the magnet is underneath, and place the plexi on the four supports inside the tray. Tape the ramp at one end of the central line, so that a ball rolled from the top of the ramp rolls along the line towards the magnet. 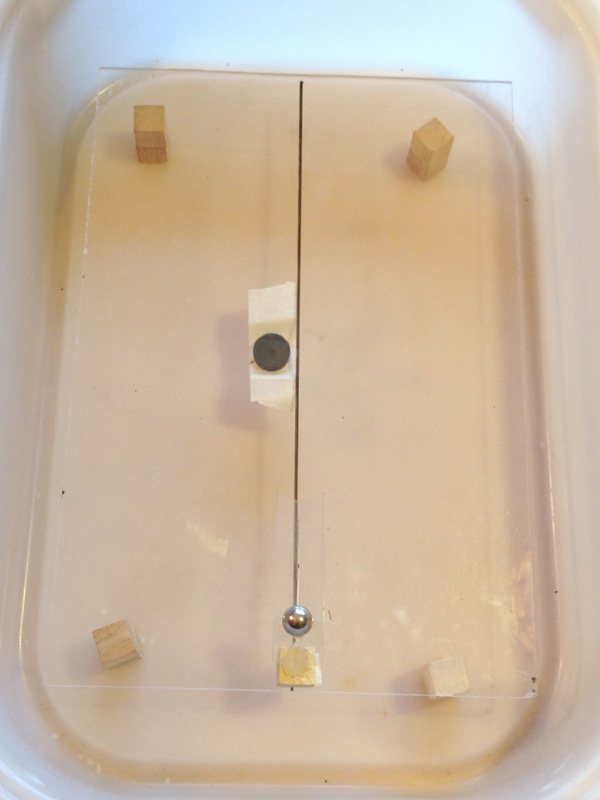 When the ball is released from the top of the ramp, it should reproducibly deflect a small amount around the magnet. If it does not, adjust the height of the ramp or the position of the magnet. 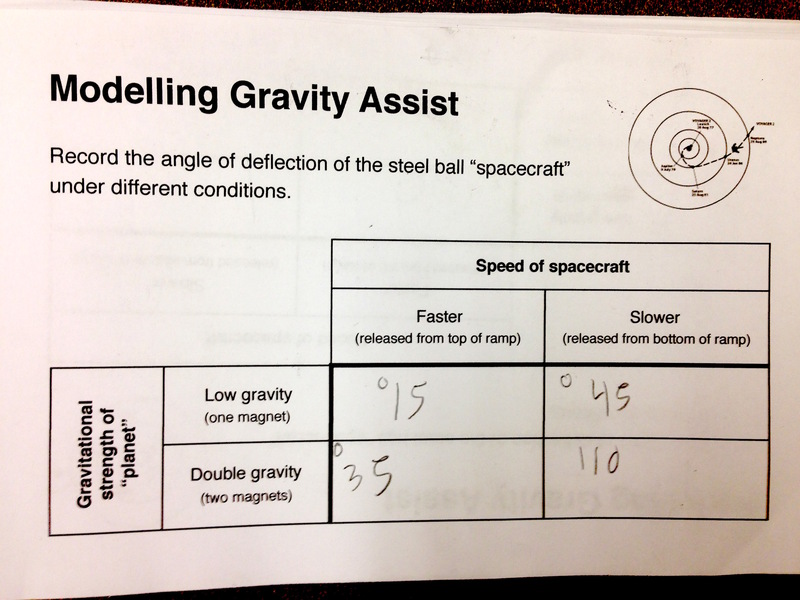 Students are asked to change one variable at a time: the speed of the spacecraft can be changed by releasing the ball from the top of the ramp (faster) or lower down (slower). The gravity of the planet can be increased (i.e. a larger planet) by adding magnets underneath the taped magnet. 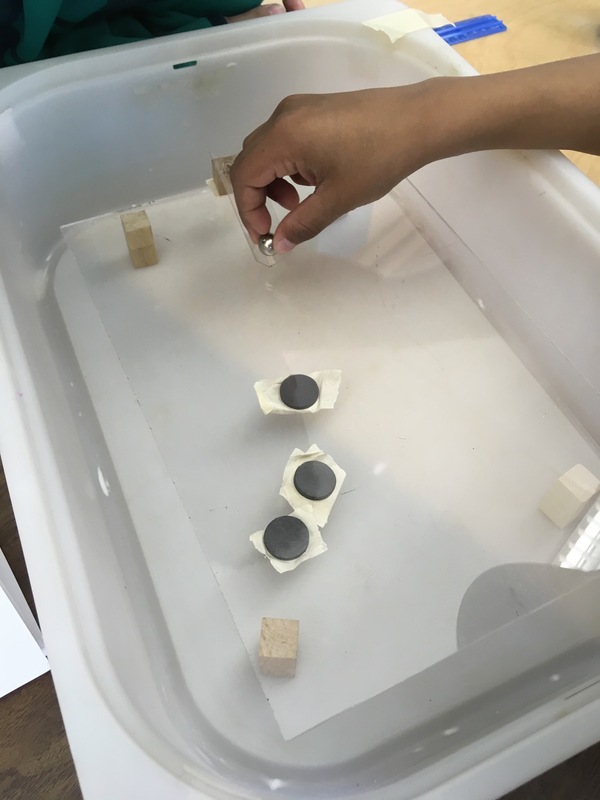 Show students how to measure the angle of deflection for the different conditions they try: make a mark where the ball rolls off the plexi, and repeat until the marks are consistently on top of each other. Then draw a line from this mark back to the centre line next to the magnet. Then use a protractor to measure the angle between the centre line and the angled deflection path. Although there will be much variability in the angles measured (depends on slope of desk, position of magnet etc) , decreasing the speed of the spacecraft by releasing at a lower position on the ramp, should generally produce greater angles of deflection. 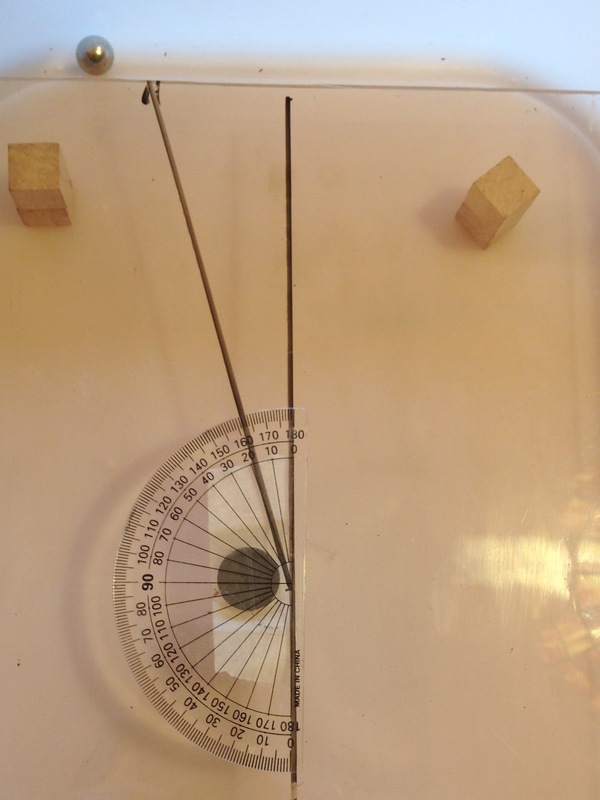 Increasing the gravity of the planet, by adding more magnets, should generally produce greater angles of deflection. A graph can be made of the increase/decrease in angle when changing from low to high gravity and high to low speed. 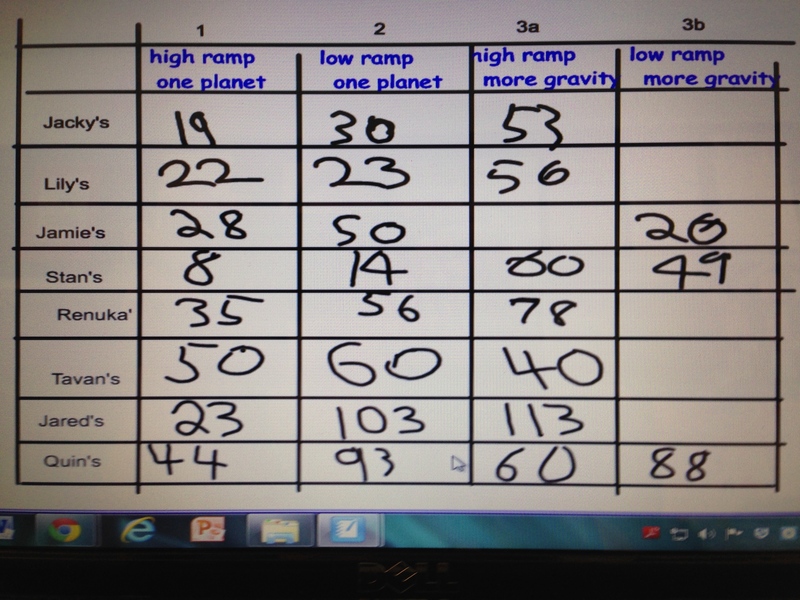 Give students more magnets and allow them to freely experiment with planet and ramp placement. Show them images of real gravity assist trajectories (see below), that they might want to try and replicate. Discuss some of the variables that the students will be working with: the speed of the spacecraft (by varying where the ball is released from), the gravity of the planet (by varying the number of magnets), the position of planet(s). Show students trajectories of real spacecraft that have used gravity assist (see below), and challenge students to replicate some of these, and design their own trajectories. Discussion: Students will want to share how they made their trajectories, some of them employing methods not in the kit (e.g. 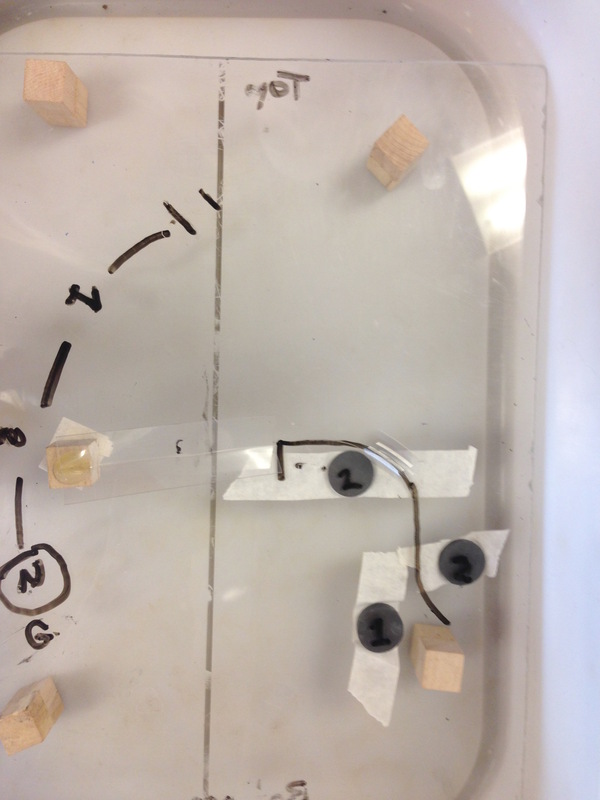 tipping the plexi to combine gravity with magnetic force to direct their ball). Direct the conversation towards how even a small tweak in the speed of the spacecraft or the position of a planet makes the trajectory change dramatically. When space scientists plan the route of a spacecraft they use complex mathematical modelling to ensure that the spacecraft reaches the intended destination. In their calculations, they need to take in to account that the planets are moving, and they cannot vary the gravity of a planet as this model can, so the launch timing is critical for success of a mission. Also reinforce the years that it takes for a probe to reach its destination planet - the distances are huge. Juno flew by Earth for its gravity assist out to Jupiter. Cassini was a 20 year mission, to orbit Saturn before descending beneath the rings and into Saturn's atmosphere. It arrived at Saturn with gravity assist from Venus, Earth and Jupiter: http://blogs.discovermagazine.com/sciencenotfiction/files/2010/06/cassin... The rocket that launched Cassini in 1997 was the most powerful available to NASA, but it still wasn't powerful enough to send the nearly 6,000-kilogram (13,200-pound) spacecraft on a direct course to Saturn. Instead, mission designers planned multiple flybys of Venus, Earth and Jupiter, using each planet's gravity to boost Cassini's sun-relative speed and send the spacecraft out to Saturn. 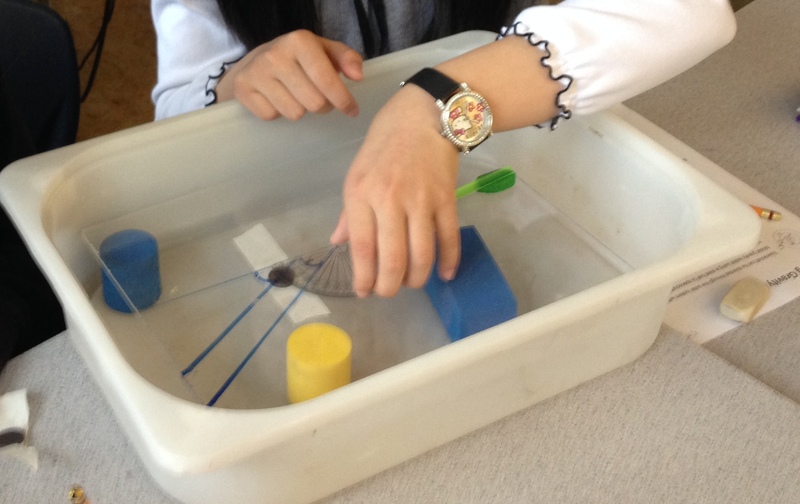 Initially used modelling clay to hold the ramp in place. Much better when I switched to the ramp hot-glued to a block.